The 0.59-carat diamond known as the Rob Red after its owner, Mr. Robert Bogel, is an extremely rare and unique collector's item. It was presumably found in one of the alluvial (i.e. ancient river) deposits located within the remote interior of Brazil. The most famous Brazilian red diamond (also the most famous red diamond, period) is a 0.95-carat round brilliant known as the Hancock Red, named after Mr. Warren Hancock, a notable colored diamond connoisseur, who began collecting these rarities in the early 1950s until his death in 1981 at the age of 65. While he also owned several other notable colored diamonds it was his 0.95-carat red stone that made news when it was sold at Christie's in 1987 for $880,000. A 5.05-carat red diamond known as the De Young Red resides in the Smithsonian Institute. This diamond is quite large but has a brown overtone. Brownish-red diamonds notably more common than ruby-like pure reds. As a unique coincidence, Mr. Robert Bogel who is an astute dealer of colored diamonds in New York City for more than 30 years had spent many of his early years in the various diamond mining districts throughout Brazil searching for rough colored diamonds, is now reunited with a fragment of the past. "The Rob Red Diamond is the most saturated and purest red diamond measured visually and instrumentally to date in the world," says Stephen Hofer, the renowned gemologist, color scientist, and author of Collecting and Classifying Fancy Color Diamonds. 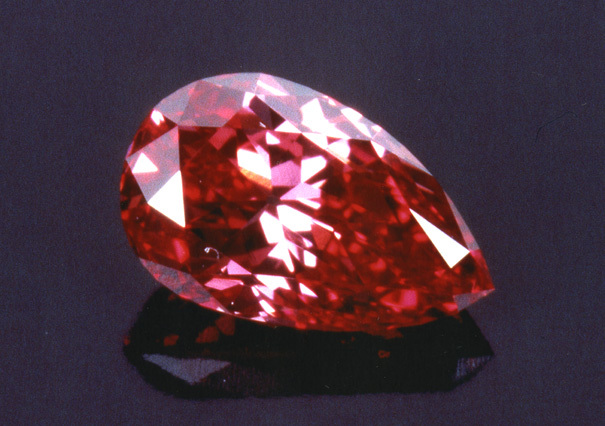 Hofer reports that the 0.59-carat pear-shape Rob Red deserves the title of Fancy Intense Red, exceeding the purity and saturation of red in the famous Hancock Red Diamond. One interesting note reguarding the Hancock Red Diamond is that the recorded strength of color for the stone, which is Fancy Purplish-Red, was the highest level ever recorded for a natural red diamond. Since that time, a handful of other pure red or purplish-red diamonds have come to light—the Moussaieff Red, for example—but all have received color grades of simply Fancy, rather than the more saturated Fancy Intense. This was all prior to the measurements of the 0.59-carat stone shown above. Hence the Rob Red is the most saturated red diamond ever recorded with a modern instrument. This diamond is also quite unique because it is relatively free of inclusions, being VS1 clarity, hence it is one of the 'cleanest' red diamonds in existence. After careful examination by other diamond experts, this stone has the potential to be labled by the world's colored diamond collectors and connoissures as the most important red diamond in the world.